My very best friend in the whole world is getting married in 20 days. TWENTY DAYS people! 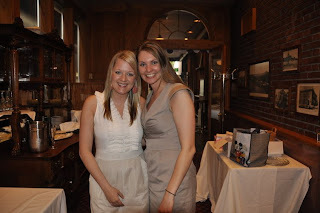 I am beyond excited for her and her soon to be hubs and so happy to be a part of the wedding. Yesterday we threw her a bridal shower. 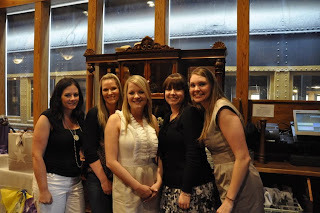 By we, I mean the other bridesmaids, her mom and me. It went great. And, even though it is pretty close to her actual wedding, to me, it was just kicking off all of the wedding festivities for the month! 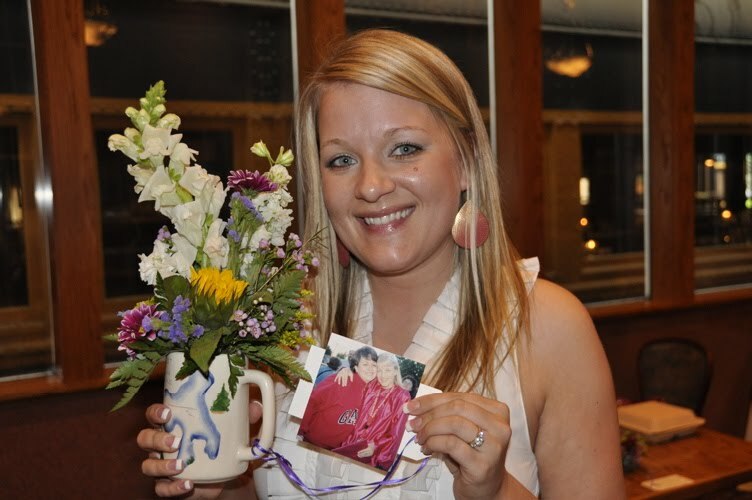 As the type-A person I am“Matron” of Honor for the wedding, I really wanted Julia to have the BEST shower possible. 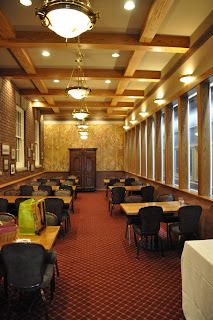 Our original plan was to have the shower at another one of the maid’s houses, but when the invite list went over 40, we decided we should look at some other options! We settled on having it at the Oregon Electric Station. It worked out perfectly, it was really affordable, the food was good, we had all you can drink champagne and we didn’t have to cook or clean up. All we needed to do was handle the cake, decorations and games. I mean really, how does that not sound perfect!? Julia’s mom handled the cake. Beautiful is an understatement. 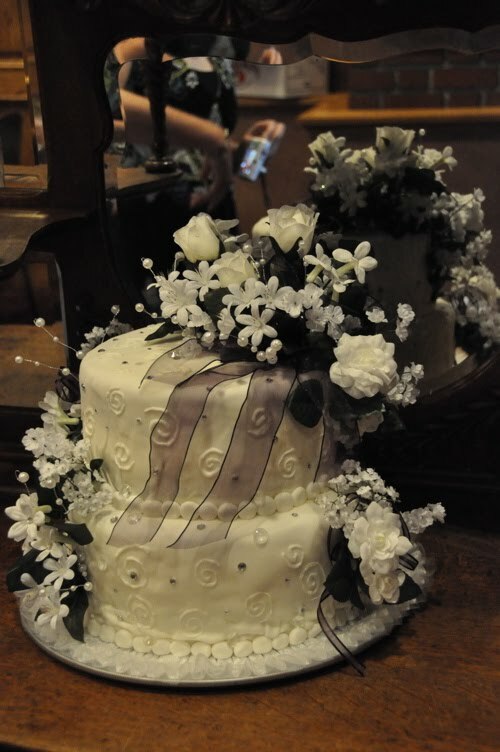 It was more like an actual wedding cake than a bridal shower cake! A friend of Julia’s mom made and decorated the cake and it tasted just as good as it looked! I took care of the decorations for the party. There was no real “theme” for the shower. We just stuck with the wedding color of dark purple. I tried to make sure the theme carried throughout everything. I bought pre-printed invitations online that were perfect. Dark purple and simple. 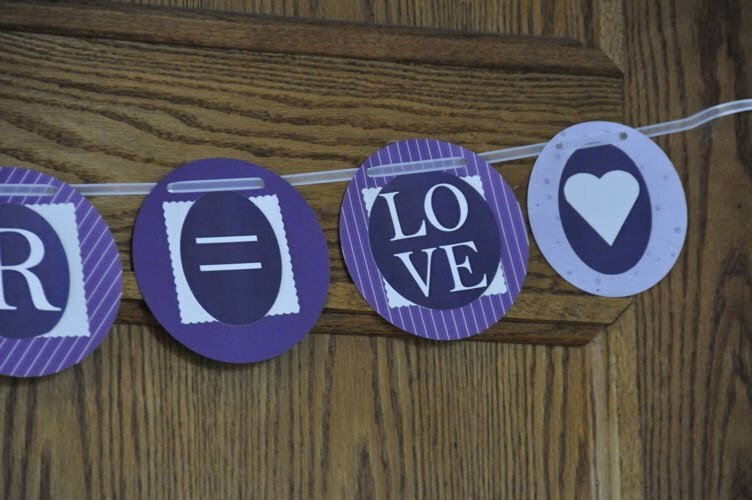 I made matching return address labels, used a purple pen to address and used the purple “LOVE” stamps for postage. Julia really liked the banner I had made for Ry’s b-day so I decided to make one similar for the shower. 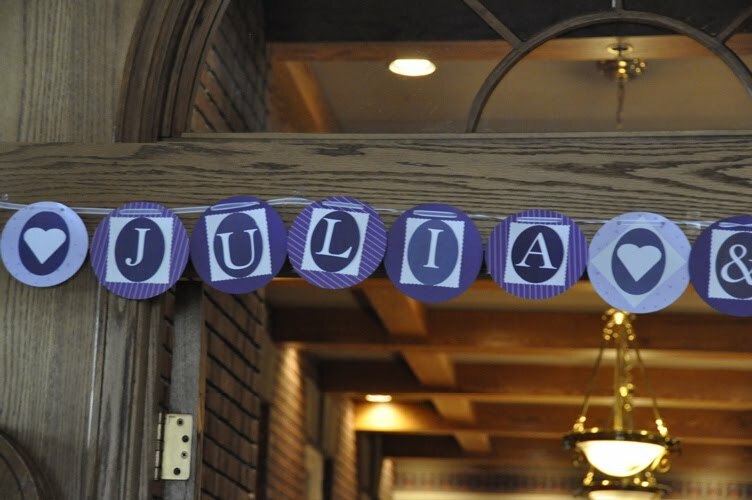 At first, I was going to have it say “Congratulations Julia”, but then I remembered how annoyed I got when people would say to me “It’s your day” or “It’s all about the bride”…because hello people…it takes the bride AND the groom to get married! 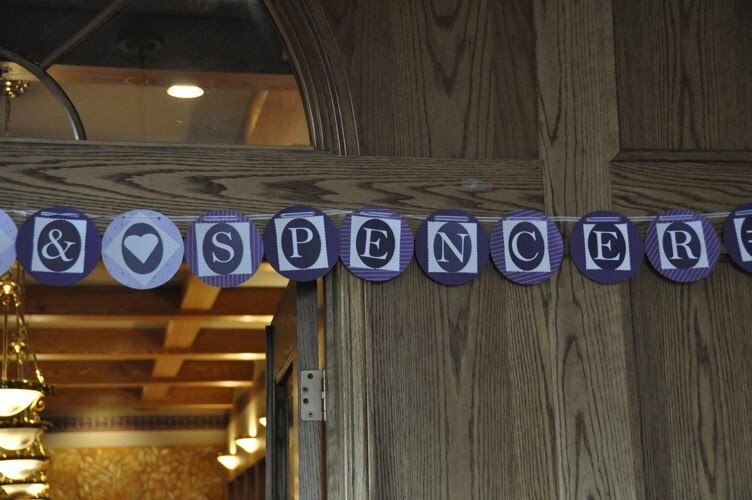 So, instead, I made the banner to say “Julia & Spencer = LOVE”. We hung it over the entryway to the room we had the shower in. Carrying on with the banner and purple, I bought Hershey’s kisses, both regular and dark chocolate (purple foil). Then, I picked up some labels at Micheal’s that are made for the bottom of kisses. I made the background dark purple and had white lettering with things like, “J”, “J+S”, “6.26.10”, “LOVE”. We had them scattered on all the tables for a sweet treat that also worked as a decoration . 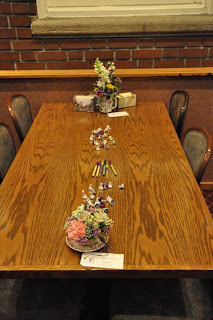 On the tables, we also had little bouquets. Each bouquet was actually put into different pieces of china from each of Julia & Spencer’s grandparents and Juila’s Aunt Sandy. 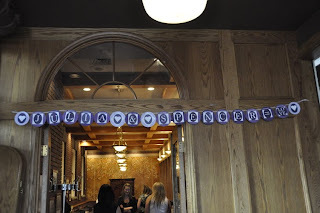 This was Julia’s mom’s idea and it was such a nice touch! 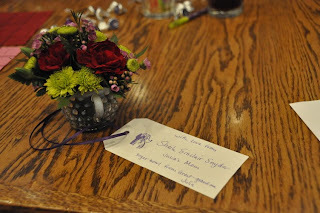 She made little coordinating tags with purple ribbon, decoration and writing to go with each piece so guests could see who each piece belonged to. It was a very special way to honor their grandparents and Aunt Sandy. 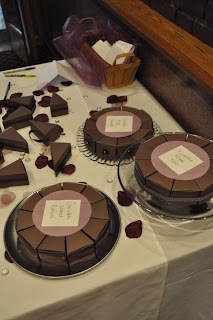 The favors for the guests were little “cake” slices. I found this kit at Michael’s and bought it on a whim…and I am so glad I did! I stuffed each piece with little goodies for the guests. I figured not everyone would like the same treat, so each little cake was stuffed with different things. I used mixed nuts, chocolate covered raisins, Hershey’s Bliss chocolate (the wrapper was purple) and sour patch kids. 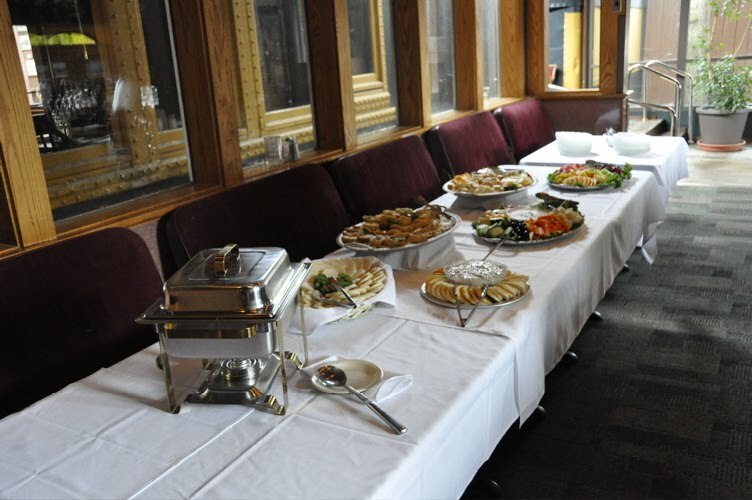 We arranged them on cake platters that we brought with us and since we were 1 platter short, the rest of the pieces decorated the rest of the table. Each “cake” was decorated with some sort of purple. 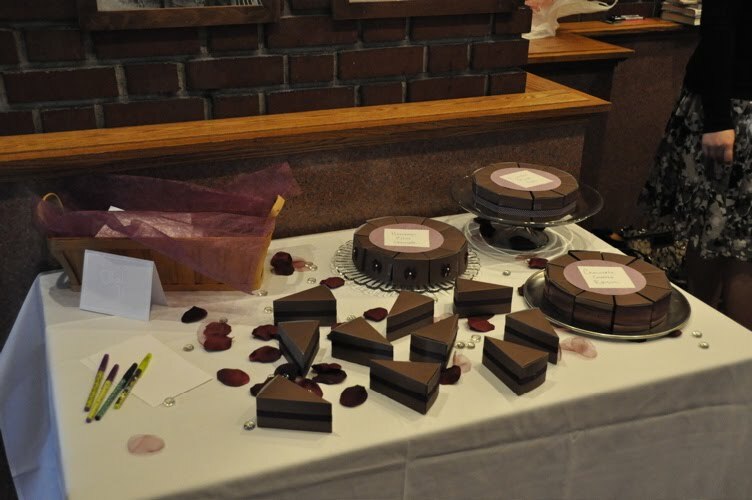 Other touches included dark purple silk flower petals and clear glass pebbles to decorate around the cake and favor table. The basket for the thank-you envelopes had purple fabric in it and the pens on each table all had at least some purple in them. For the games, we decided to go simple. With 30-40 people, it needed to be easy and relatively fast. We had originally thought about doing a wedding trivia game, but the other MOH nixed that idea when she read the questions and realized NO ONE would get any other them right. She decided to do bridal bingo instead. That was pretty fun. Everyone was handed empty bingo cards and they had to fill the spaces in with items they thought Julia would receive as gifts. 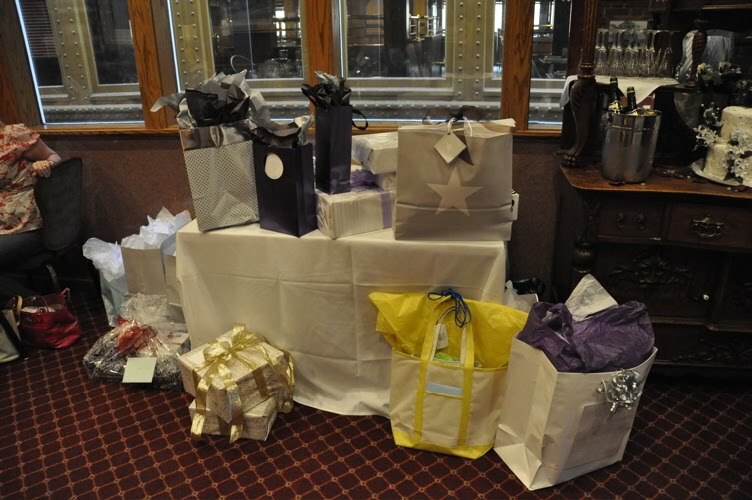 As Jules opened her presents, they marked off the ones they had written down. The first person to get a bingo, won! For the prize, we gave away a gift certificate for a pedicure. We also played the “timer game” which is really not a game at all. We brought a kitchen timer and set it for random intervals while Julia opened her gifts. If she was opening your gift when the timer went off, you won. We did it 3 times and had 3 flower baskets to choose from for those winners. Lastly, as people were coming in, we had them address their own thank-you note envelopes. Then, at the end we had a random drawing from the envelopes and the winner took home a fresh flower bouquet in a coffee mug. Another thing we did that was not actually a game, but something to keep guests occupied/entertained was to have each person write a challenge, or encouraging word or advice for the bride and groom on a note card and seal it in an envelope. Then, on the outside of the envelope, they wrote a date. On that date (AND NOT BEFORE JULIA!!! ), Julia & Spencer will open and read the note. Food was good. Cake was great. Game was fun. Things ran smoothly. All in all, the shower was a success! 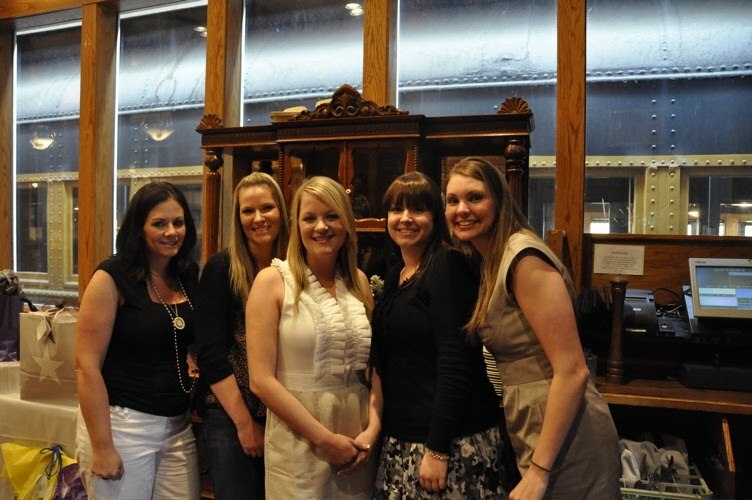 This entry was posted in marriage, party, party people, Uncategorized on June 6, 2010 by katherine.